Partners Uttarakhand Gramya Vikas Samiti, Integrated Livelihood Support Project (UGVS-ILSP), India and High Value Agriculture Project in Hill and Mountain Areas (HVAP), Nepal attended a week long on-the-job training at the International Centre for Integrated Mountain Development (ICIMOD) in response to a request from AdaptHIMAL (Enhancing Adaptation Capacity and Resilience of the Poor to Climate and Socioeconomic Changes) partners, in developing and integrating Geographical Information System (GIS) into their existing Management Information System (MIS). While the overall focus of the training, was developing a hands-on understanding of web-based geospatial solutions adopted at ICIMOD, specific sessions focused on migrating data from an existing static installation of map based information system into a GIS based platform. Vishwas Chitale and Rajan Bajracharya, with Geospatial Solutions, led the week-long training, along with other members from the Geospatial Solutions showcasing relevant case studies. The training covered basic concepts related to MIS, and designing, managing and maintaining spatial information. Special sessions were also dedicated to integrating and modifying the existing map-based information systems for migration into a GIS platform. 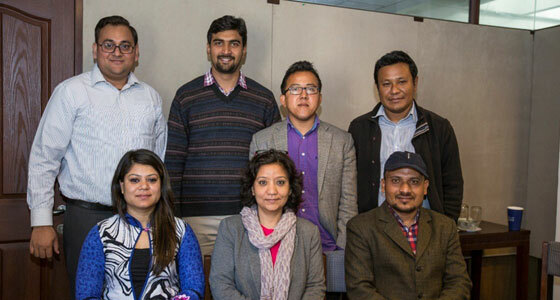 The partners also interacted with the web development team and were introduced to various geospatial web applications being developed for the different programmes within ICIMOD.